Our friend Shawn Callahan has been following the work on the book – for years! He has been privy to various drafts and has recently been using the Community Orientations in his work with communities. Recently he realized he wasn’t so clear on orientations 7, 8 and 9 so this past weekend we hooked up on Skype and talked through them. Here is Shawn’s post and the podcast. BTW the community orientation exercise simply involved getting the participants of the workshop to plot on a radar chart, which I’d drawn on a whiteboard, where they thought the community was currently and then do this again for where they would like to see the community of 12 months time. It generated a terrific conversation and a feel of mutual purpose. Here is what the result looked like. 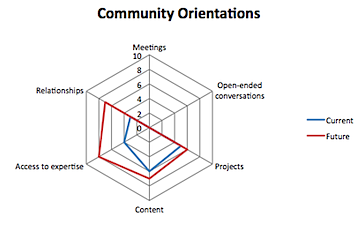 I had not thought about using the orientations for community plans or aspirations. 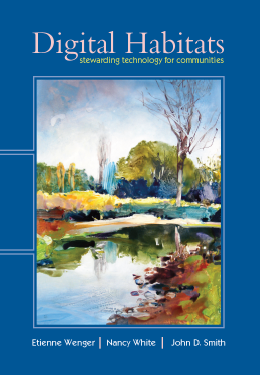 I had been using them as a diagnostic for technology stewards to a) become aware of key community orientations and b) then use that to plan or tweak the community’s technology configuration. But both make a lot of sense to me!